For my next professional reading this summer I chose 25 Quick Formative Assessments for a Differentiated Classroom by Dodge & Duarte. This was a sharp contrast to my last professional reading, because Disruptive Thinking was more anecdotal, motivational, and a lot of theory (with one overarching framework and tips to implement it). This book does what it says; it has 25 types of activities, and you could pretty much flip to one from the table of contents and try it out tomorrow without reading the book cover to cover. This book starts out defining formative assessment and setting the purpose for making the time and effort. By page 15 I was peeking through the book to see “when are we getting to the activities?” I could see that before getting there, there was information on digital assessments (which I found beneficial) as well as tips for what to do once you have looked at formative assessment data (basically: differentiate your instruction). It also discussed general ways to tailor formative assessment to learners who need more of a challenge or more scaffolding, including students with special needs and ELLs. The actual activities begin in chapter 4 on page 33 (of 121). The assessments are grouped into categories (Summaries, Graphic Organizers, Visual Representations, Collaborative, and Self Assessment). They are explained and there are sample worksheets (as well as a way to access them to print online, which I was impressed with). The worksheets can be adapted for multiple subjects. For example, in the Find Someone Who page (p. 104-106), there are a couple dozen sentence starters to help reinforce academic language while students are demonstrating their understanding of the concept. So whether you want a quick print and go or you have time to adapt a page specifically for your content/language objectives, you're covered. To get the resources, I went to the website provided on the last page of the book, entered my Email address and a code, and was able to immediately download a zip file. It contained 40 assessments in Word and PDF formats. I almost assumed that Word would allow me to edit, but I checked them over and unfortunately I was wrong. Not only will I have to keep the phrasing the same, but there were some formatting errors I was unable to correct. The only editable parts are those that fields that are intended for students to fill in. My school does run an old version of Word, so maybe it's my machine that's the problem. But at least from my perspective, although there are tips on how to adapt a rubric in the book, I will need recreate the pages provided if I want to tailor the language of the assessments. Each activity also has a "Step by Step" to remind you about the gradual release of responsibility and tips for tiering (including separate tips for ELLs and students who need a challenge). For many assessments, a word bank of academic vocabulary is provided to help students practice using words in discussions. (Each assessment also has a "tech connect" that lists apps that can be used and why. I'm not a one to one classroom, but I would imagine that if I was, the technology integration would be one of the most valuable parts of this book! Many of the sheets discussed in this book were already familiar to me, but it's a good resource to have a bunch at your fingertips when you need to change things up. The tiering was also useful if you have a student who is stuck and you're running out of ideas on how to scaffold. One of the assessments I've used over the years is the Matrix. It can be used in character analysis, history, and science, but one of my favorite uses is in geometry when comparing and contrasting shapes. You can do this for quadrilaterals, 3D figures, or 2D figures. You can see in the photo how I use it as part of my 2D figures unit to help students compare and contrast triangles. Now, having read this section of 25 Quick Formative Assessments, I'll be able to get more mileage out of this page. 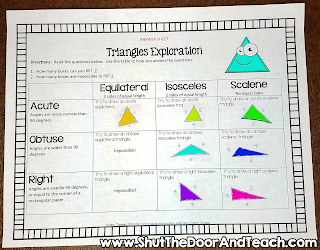 I can have an anchor chart with academic vocabulary and sentence stems to get kids saying, "An equilateral triangle has _____, however an isosceles triangle ______." 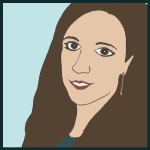 "Neither the obtuse nor the right triangle can be _____." I'm reminded these sentence stems are great for ELLs as well as the rest of the class. I'm also considering having my class create their own matrix when they have computer time, in Excel, Google Sheets, or Canva (Canva being a resource I'd never heard of before!). So even though the format of the graphic organizer wasn't new to, this section was useful. Another thing I like about each chapter is that it refers to which of the Multiple Intelligences that are tapped into for each assessment. 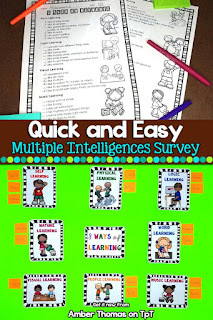 It got me thinking about how I could get more mileage out of my Multiple Intelligences Survey. 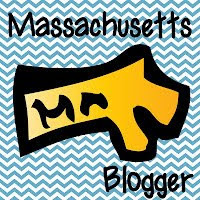 I was inspired to update it to include suggestions for content delivery, as well record keeping so you can plan with students in mind. 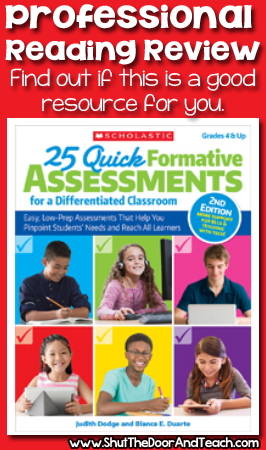 Obviously, if you want some new quick formative assessments for your class, and help understand how to use them, this book would be helpful for you. It's also designed for grades 4 and up, although having taught 3rd grade, I think third grade teachers could use the majority, though maybe not all, of the materials listed. 1. You need help tiering for a wide range of learners. 3. You want more ideas for assessing ELLs. Have you read 25 Quick Formative Assessments? This is the second edition, so I'd love to hear what you thought of either edition in the comment section. Disclaimer: Scholastic sent me a free copy of this book in exchange for a fair and honest review.